Having improved our bank balance (cash holding in the steel tool box) at Luneville, we took the soft option on arriving in Bautzen on the 2nd July, when we decided to take B&B for 4 nights at a small Hotel in the centre of town. Our Hotel was quite close to the circuit and the race paddock which had the appearance of an auto jumble when we arrived the day before the start of practice. In addition to used racing tyres, chains, plugs and the usual other bits and pieces being sold off by many of the riders, I noticed one Australian doing a roaring trade selling denim jeans to a queue of locals who kept appearing from the back of his van! Nearly all of these sales were transacted in hard currency and we had no idea where the buyers were obtaining their American dollars and West German Deutschmarks, both illegal tender in East Germany in 1964! Half of the circuit was run on an autobahn (now the A4, E40, and a major road link East of Dresden, between Germany and Poland) closed for the duration of practice and the races. The start line was approximately 300 yards from the end of the closed section of the autobahn dual carriageway where riders were required to make a very sharp left hand hairpin turn onto the other side and direction of the autobahn, after this half mile or more straight, there was a sharp right turn off of the autobahn down into the town and around a park before returning and climbing up onto the autobahn and the long straight back to the start and finishing line once again. 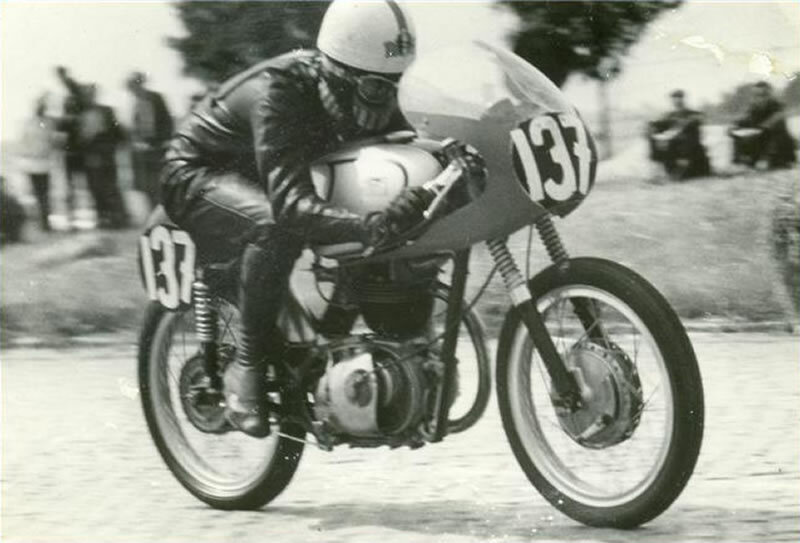 Again the Works MZ,s were out in force with Heinz Rosner and Dieter Krumpholz leading the charge, Jawa and CZ Works riders were also present, further reducing the possibility of us privateers taking away any silverware. The weather was perfect for practice and I had good runs on my 125 and 250125 on cobbles Bautzen but I could just not believe my eyes when the official practice time sheets were published which had me recorded as 3rd fastest in the 125 class and down to start on the front row of the grid the following morning. There clearly had been a mistake as all of the MZ,s and some other marks were passing me on the long straights at more than 20 or 30 MPH. For the 250 practice, I was recorded as 8th fastest which was for me a good result and much nearer the mark! Starting from the middle of the front row and making a great start in the 125 race I was nevertheless passed by at least a dozen riders before reaching the 1st left hand hairpin bend. As we reached the bend, all of the MZ’s closed up in line on the right hand side of the autobahn just as they had done at Schleiz, and as before, I left my braking to the very last moment and shot down on the inside of them, coming out onto the other side of the autobahn in 3rd or 4th position. Many of the riders swept past me again before we reached the other end of this long straight when once again they started to line up, this time on the left hand side and I dived through on the inside to pass quite a few of them. This went on for lap after lap when at last some of them realised that the only way to stop me from pulling off my manoeuvre was to place themselves on my line when approaching the hairpin and other tight bends. With these blocking moves, I was gradually pushed further and further back but still pleased to finish in 12th position up against far more competitive machines in this class. 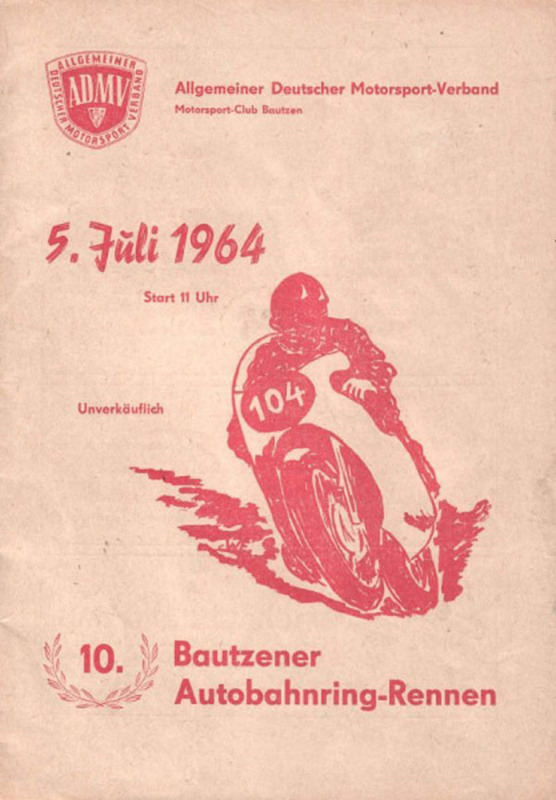 The race was won by Heinz Rosner (MZ). After another good start in the 250 race I managed to stay with the leaders for quite a few laps passing riders time and time again going into the hairpin bends and getting many good tows down the long straights. But slowly the Works MZs got tired of playing with me and I began to drop back however I was still happy with my 4th place at the finish. Heinz Rosner won the race followed home by Dieter Krumpholz in 2nd place, both on factory MZs, but Dieter was later disqualified for some reason. The following morning before checking out of our Hotel we had a good look at the map when we decided we could reduce the distance significantly to Pistany, our next race meeting in Czechoslovakia, if we drove directly South to the Czech border and avoided going via the West/East German border crossing we had used when entering East Germany. As both East Germany and Czechoslovakia were on the same side of the Iron Curtain, we did not think we would encounter any difficulties in crossing from one to the other. Arriving at the border in the late afternoon, the East German border police made it very clear that we could not cross and that we could only leave East Germany through the same crossing by which we entered. They even warned us that we could be arrested for failing to take the direct route from the border to and from Bautzen! After 2 or 3 hours of waiting and telephone calls to their Superiors, they decided to let us go and we turned around and headed back in the direction of Bautzen. A few miles on we stopped at a garage for a break when we explained our predicament to the garage owner who was quite friendly and spoke good english. After checking that his staff and other customers were otherwise occupied, he explained that there was an unmarked and unmanned crossing point on the boarder some 15 miles away and he sketched out a map on a small piece of paper indicating how to get there. He assured us that once across we would have no difficulties with the Czech border police, even if they saw us crossing the border! As crossing the border at this point was going to save us a lot of time and petrol we decided to take a chance and set off in the direction of the secret crossing point as indicated on the scribbled map. Half an hour later we left the road and headed off into the forest down what appeared to be no more than a farm track and a fire break between the trees when suddenly we saw the wire fencing and the border in front of us. We could not see any guards and were about to lift the single unlocked pole blocking our way when we saw the notices both sides of our track indicating (in german and Czechoslovakian) that we were in a military zone and what made us freeze was the unmistakable sign that there were land mines in the area! Our friendly garage owner had not mentioned anything about land mines! so not being sure if we had taken the right turning off into the forest we very slowly backtracked all the way to the main road and did not stop again until we reached Bautzen.